A DOGGED pair of local residents have tracked down one of Molesey’s most significant historical artefacts. Paul Gossage and Steven Baker spent seven years searching for the ‘Molesey Shield’ - a 3,000-year-old Bronze age shield which was discovered in the Thames near Molesey in 1864, and has been missing for four decades. They painstakingly trawled through records at Surrey Archeological Centre, and enlisted the help of Marion Uckelmann - the leading expert on European Bronze Age shields - to determine that an artefact on display at the Hunt Museum in Ireland was in fact the ‘Molesey Shield’. Paul told The Molesey News that the shield was first discovered by a boatman in the 1860s, during a low river, and about a mile upstream from Molesey. Shortly after its discovery it was bought by a James Milner of Palace Road, Molesey, and was featured in the prestigious Victorian periodical ‘The Gentleman’s Magazine’. In 1867 it went on display at the emminent Society of Antiquaries in London. Paul and Steven believe the shield stayed in Molesey until 1882 when it was sold to a collector named Augustus Pitt Rivers for his private museum in Dorset. Over the years its provenance was lost and in the early 1970s the sheild was sold by Pitt’s grandson to the Hunt Museum along with two other items from North-East Ireland. It became known as the Antrim Shield, a name still used. Paul and Steven (whose father is the Molesey historian Rowland Baker) are creating a Wikipedia page on the internet to tell the fascinating story of the shield. And a display has been put up at Molesey Library in Walton Road. 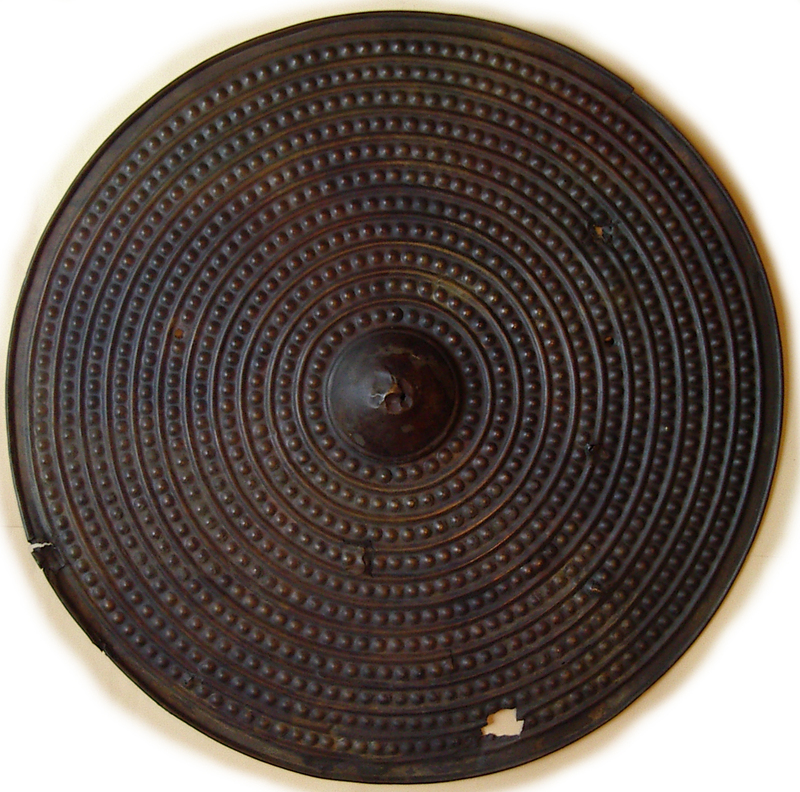 The shield is 64cm in diameter with a dome shaped central ‘boss’, and is a superb example of the craftmanship of its time. It will have been created from a single block of bronze, forged in an open fire and beaten thinner - a painstaking process that will have been repeated at least 200 times. It most likely had a ceremonial use and may have seen battle before it was placed in the Thames as a ‘votive offering’ to the gods.